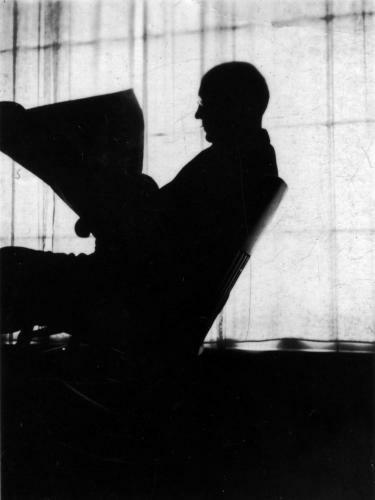 The silhouette of a man reading a newspaper symbolizes the point of this essay. In order to make an intelligent argument about anything one needs to be informed. In higher education a variety of philosophies are presented for evaluation and the student eventually succumbs to a particular way of viewing the world which may have been totally different from original preconceptions. It is not always a question of right and wrong, rather the question really is which side is the more committed. The winners write the history books. The losers plan for the day when they might become the winners. The examples are endless. War usually settles an argument at least temporarily. The American Civil War, World War II, the Vietnam war are but a few examples. What about the Crusades? 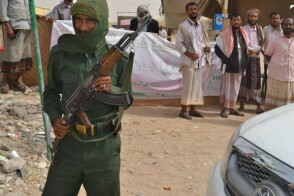 Just open your daily newspaper to see that the conflict continues. The issue in the Middle East in some ways is analogous to the partition of Africa. In the case of the Middle East the collapse of the Ottoman Empire at the end of World War I led to the Sykes-Picot Agreement in which Britain and France divided the spoils of war without regard to ethnicity thus pitting Shiite and Sunni against each other’s interest in places like Iraq. Likewise, Africa was divided along boundaries established in Paris and London without regard to ethnic considerations. Nigeria is an example of a country which finds itself in this situation having competing interests from the Yoruba, Ibo and Fulani. Where are we going with this discussion? At the end of the day we all have to make a choice. I prefer to support the United States and the freedoms which it has given to me: Life, Liberty and the pursuit of Happiness. Brooklyn, N. Y. 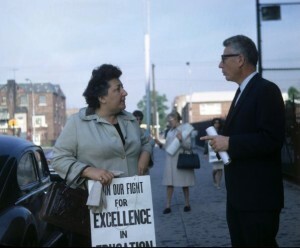 – September 8, 1967: New York City teachers walked out of school on the first day of the new term in protest. We, in the Western world, are essentially a product of Enlightenment thinking established in Europe. I believe that we tend to view the world in terms of human rights and the rule of law. This view is not universally held by other peoples in other parts of the world. For many, the power comes from the barrel of a gun. Tribal connections are the norm. These societies have not evolved along the same lines as in the West. It is difficult to simply impart a democratic system that operates as a federal republic on such societies. I often recall the movie The Time Machine in which society in the year 800,000 A. D. is divided between the Eloi and the Morlocks. It may be an oversimplification, but a truly informed individual will gather information from all sources in making a judgment. Only when you understand all sides of an argument can you make an informed argument supporting your position. While we may believe that the world is populated by only Eloi, I would argue that the Morlocks are alive and well in their realm. Over time positions can change. In Dred Scott v. Sandford 60 U. S. 393 (1857) the Supreme Court supported the continuation of slavery in ruling that Scott had no standing before the court as he was considered to be property. In Cherokee Nation v. The State of Georgia 30 U.S. 1 (1831) the Cherokee people were denied standing before the court as they were viewed as a domestic dependent nation. During the American Revolution our Founding Fathers were considered to be rebels and traitors by the British. Had the outcome been different they would have been hung as terrorists. Following the failed Bay of Pigs invasion in 1961, President John F. Kennedy stated that “Victory has a thousand fathers, but defeat is an orphan”. He was quoting an old axiom of uncertain origin. The point is well taken. Suicide bombers from the West Bank are viewed as martyrs in that part of the world. Will any amount of discussion with such people make them change their position? Unfortunately, I think not. The passage of time and the coming of new generations may be successful in the long run. My father served in the U. S. Army in the 27th Infantry Division during World War II. The way the story goes was that he was the lone survivor from his unit of the largest banzai charge of World War II on Saipan (July 7, 1944). Known as the Raid or Sake Raid by the men who survived, 4311 Japanese soldiers and Korean laborers were killed out of approximately 5,000 attackers. They just would not surrender. No prisoners. Kill or be killed for the most part. My father was one of only 15 survivors from his company at the end of the war. My point is that in the heat of such a battle it is not possible to sit down with your enemy and discuss the virtues of the Enlightenment. Jorge Agustin Nicolas Ruiz de Santayana y Borras a/k/a George Santayana said, “Those who cannot remember the past are condemned to repeat it”. We have all heard the quote many times but it goes to the heart of this essay. Professionally, my Master’s thesis explored the policy of genocide committed by the country that I love against American Indian Nations. 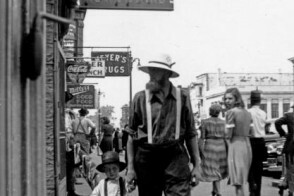 American Indians were stigmatized as “the Other” as were Jews similarly stigmatized as vermin by Nazi propaganda during the 1930s. This made the killing easier as the Nazis considered Jews to be subhuman. Üntermenschen. Morlocks, if you will. American newspapers such as the Rocky Mountain Daily News in Colorado reported similarly on the American Indians. Even eastern newspapers fed the propaganda although to a lesser extent. 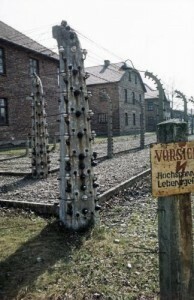 Oswiecim, Poland – March 14, 1979: Fencing of the Camp and the Prisoner’s Blocks. The Nazis instituted the Nuremberg Laws in Germany which were perfectly legal under German law. These laws systematically removed Jews from German society, professionally, economically and in every other way it was possible to destroy a person’s dignity, taking away their property and revoking their citizenship and basic human rights. An informed public through education is able to make rational choices. It has been said that there are no examples of a democracy ever attacking another democracy. I had to think on this for a while before coming to the same conclusion. I suppose that in a perfect world we would all be Eloi. This is not possible as societies develop along a path unique to their situation. Through education using the written word and presenting all sides to an argument comes toleration. Toleration prevents genocide. As of this writing the United States is involved in just such an effort to prevent genocide from becoming a fact in IRAQ as ISIS seeks to kill Christians, Yazidis, Shiite Muslims and other minority peoples in the areas under their control. I find that so many people today are involved in texting with their smartphones. While the dangers of this behavior are evident not only with driving a vehicle, but also involved with other projects which demand full attention, I do think that it is good that people are using the written word to communicate with each other. Perhaps if we are all still around in about 10,000 years human beings will have developed oversized thumbs from all of this texting. I can also visualize smartphones that you will be able to simply place next to your skull and you will be able to transmit your thoughts telepathically. If this happens we might lose some of the ability of speech. Fortunately, I will not be around to witness such a development. 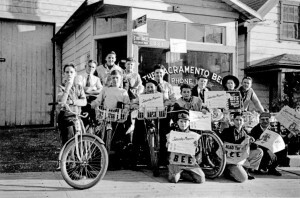 California – June 18, 1948: Delivery boys pose for a group photo. 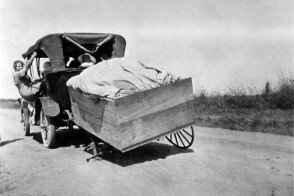 Date is approximate; true date unknown.